Sound Off: Jonathan Levine's 'The Night Before' - What Did You Think? Now that you've seen it, what did you think? Three wise men. One wild Christmas. Now playing in theaters is the new Christmas comedy The Night Before, formerly known as X-Mas. Three friends get together on Christmas eve in New York to have one last party together before they each go their own ways. 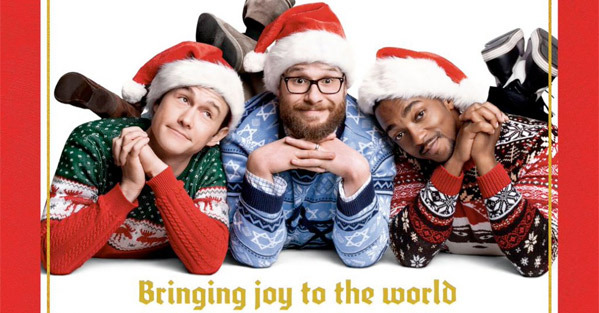 Joseph Gordon-Levitt, Seth Rogen and Anthony Mackie are the guys. The cast also features Jillian Bell, Lizzy Caplan and Ilana Glazer. So is it any good? One of the best Christmas movies, or not? How much did you laugh? Once you've seen it, leave a comment below with your thoughts on The Night Before. To fuel the fire and get this party started, The Night Before is good fun. I didn't love it, there's not as many memorable moments as I was expecting. Despite it not being the kind of movie I was expecting, I was still presently surprised. There's a sweet side to it, a charm that comes out through these characters doing crazy things. Eventually they realize how important friendship is and I was delighted to see that become the emotional core of the story. I will mention that Ilana Glazer as the Grinch is awesome, she's so badass. Rogen is hilarious when he's on all the drugs. Overall it's a fun movie that will leave you with a warm, fuzzy feeling. Just like Christmas! I'm also glad it captures the beauty of New York during the holidays so nicely. What did you think of Jonathan Levine's The Night Before? Christmas gold or a lump of coal? It's a good Netflix and Pizza movie. Not really worth paying for. Good thing I went to a free screening. Good one liners. Not much substance. I enjoy Seth Rogan's brand of comedy, except Observe & Report. I thought this film was very funny and there were parts that had me in tears but it was predictable at times. Friends separating half way through the film and then getting back together after realizing how important friendship is feels so overplayed at this point. Still, went in with really low expectations but was pleasantly surprised. Mr. Green was hands down my favorite character in the movie. I love seeing Jillian from Workaholics in other comedies, she is hilarious.